We went to see the world premiere of $5 cover. It was awesome. BTW I shot the picture that is the poster. 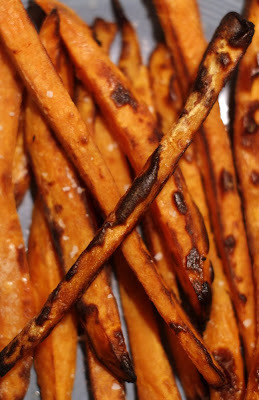 Sweet potato fries made from Whitton Farms sweet potatoes are the perfect post-movie snack. 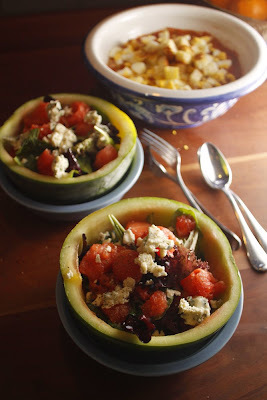 On Tuesday night, we had gazpacho topped with hard-boiled eggs and croutons along with a watermelon and blue cheese salad served in the hollowed-out rind of the melon. I stuck the melon rind in the freezer so that the salad was nice and cold. The dressing was a simple-but- delicious combo of honey, lemon, and olive oil. panko-coated goat cheese. The dressing was simply a good olive oil, 10-year-old balsamic, shallots, and a drizzle of honey. Our main course was marinated shitake skewers over carrot and ginger risotto. One of our favorite farmers, Van Cheeseman, grows the meatiest and most flavorful shitake mushrooms you will ever taste. I can't tell you how much I am looking forward to this summer and all of its bounty. All but the can of tomatoes, eggs and croutons goes into a food processor. Pulse until chunky, but not liquidly. Place into a large bowl. Empty can of tomatoes into the food processor and turn on until liquid. Combine with vegetable mixture, and refrigerate for half an hour. Stir, and top with eggs and croutons. I'm working on a new flash version of my photography website. Click HERE to check it out. Please let me know what you think. The home page will cycle through images from my portfolio, and then you can access two personal projects via the "galleries" button. Boil water and add boullion and garlic. Slowly add the grits as you stir. Reduce heat to a simmer and cook grits covered for 40 minutes until they are very thick. Set aside to cool. Sauté the chopped pepper, onion, and celery in olive oil over medium-high heat until the onion is translucent and all of the liquid has evaporated. Add sautéed vegetables, spinach, kidney beans, and hot sauce to the grits. Sir to incorporate. Cover and refrigerate two hours. All goes into a food processor. Blend until smooth. Portion into patties and brown in a non-stick skillet with a little olive oil. Serve on sliced French bread with remoulade sauce, heirloom tomatoes, and iceberg lettuce. Dissolve the boullion cube in the water and bring to a boil. Add the brown rice, reduce to a simmer, and cover. Cook rice for 40 minutes or until tender. Set aside to cool. Sauté onion, pepper, and garlic in some olive oil until the onion is translucent and all of the liquid has evaporated. Do not burn the garlic. In a large bowl, mix together the rice, sautéed vegetables, corn, and black beans. Take 1/3 of that mixture and the chipotle peppers, place it into the food processor, and pulse until it has broken down. Add the two mixtures together, and stir in the wheat gluten. Chill covered for about 2 hours. Portion into 3-4 inch patties, and brown in a non-stick skillet with a little olive oil. 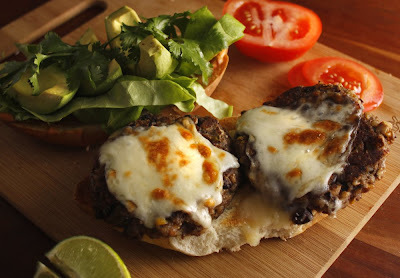 Serve on torta bread with mayo, tomato, sliced red onion, lettuce, avocado, cilantro, lime, and melted Oaxaca cheese. Dissolve the vegetable broth cubes in the water, and bring to a boil. Add the oatmeal, and stir until you notice that it has begun to thicken. Reduce heat, and simmer for 40 minutes or until all water has been absorbed and the mixture is thick. Add remaining ingredients and work the mixture with your hands to incorporate. Portion into 6-inch patties and fry in a non-stick skillet with a little olive oil. 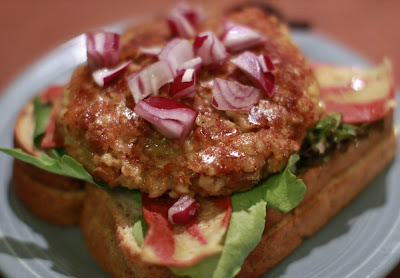 Serve on oat bread or soda bread with mustard, mayo, lettuce, tomato, and tempeh bacon strips. Everything but the parsley and panko goes in to the food processor, and is blended until smooth. Mix panko and parsley into the chickpea mixture. Form into small balls and fry in olive oil until crispy. Alternatively, you may brush them with olive oil and bake them in a 400 degree oven until golden. 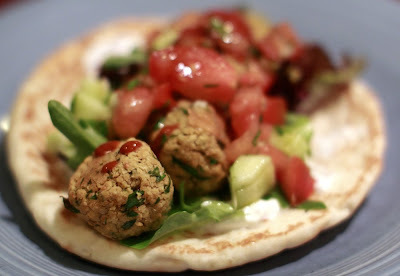 Serve on warm pita bread with Greek yogurt, hot sauce, and cucumber dressing. When you walk into Whole Foods head past the vegetables and straight back towards the beer. I Will be in the community room. The class starts at 6pm. I really hope to see you all there. Whole Foods has fiddlehead ferns right now. They are so cool looking and taste so fresh. The price looks expensive at 14 dollars a pound, but I got enough for this dish for 3 dollars. They taste like a cross between arugula and asparagus. I would describe the flavor as slightly bitter and grassy. I imagine they would be great on top of a salad or in a stir fry. 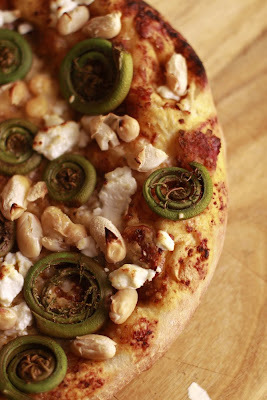 I used them to top a pizza along with goat cheese and cannellini beans. It was awesome. Go get some. I have a scheduling conflict on Sunday afternoon that I can't resolve. The time for the veggie burger cooking class has been moved. The class is still on Sunday the 26th, but it will now start at 6pm. We should wrap up around 7:30pm or 8:00pm. 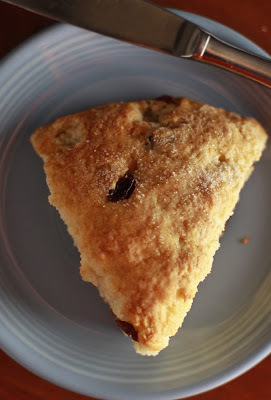 I have been working hard on refining my recipes, and I think they are delicious. It should be tons of fun. I hope everyone can still make it. 1st I bought myself one, and then (because I liked it so much) I bought one for my friend Wendy for her birthday. What is it? 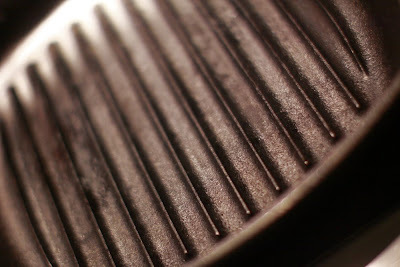 A cast-iron grill pan. I have not been this excited about a kitchen gadget since I got my Cuisineart 14-cup food processor. I can use my new grill pan to put picture-perfect grill marks on everything from tempeh to tofu to panini sandwiches. The best part is that it imparts a smoky flavor onto everything that it touches. The raised areas serve to mark the food with the characteristic lines, but the wells in between the lines catch all the oils and juices and turn them into flavorful smoke. Yes, you will need to turn on your vent-a-hood. You may even need to open your door, but it is worth it. I opened my last can of store-bought enchilada sauce more than three years ago. As much as I loved enchas (as we call them), I could not stand the metallic, acrid taste of most prepared sauces. I set out to figure out how to make it on my own. For some odd reason, I never looked at a recipe, so traditionalists beware. I just grabbed a pot and started throwing in dried peppers and garlic until I came up with something that I liked. The truth is, like most things, I never make it the same way twice. You can use the provided framework to experiment with fresh, dried, and smoked peppers. Each pepper carries with it its own unique flavor profile and heat level. Make plenty of this spicy sauce and freeze what you have leftover in a tupperware container. 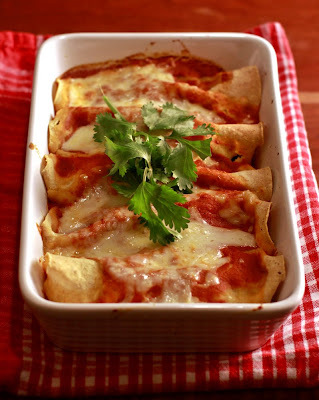 Then next time you want to make huevos rancheros, enchiladas, or burritos, you are already halfway to homemade. Drizzle a few tablespoons of olive oil into a large pot, and set to medium heat. Add the dried anaheim peppers and toast in the oil until brown and fragrant. Add the onion, and cook until translucent. Add the rest of the veggies, and add enough water to the pot to just cover. Bring to a boil, and then reduce heat to simmer. Allow to simmer for about 45 minutes to an hour. Use an immersion blender to blend the sauce smooth. Add salt to taste, then add a touch of sugar if you think it needs a bit of sweetness. 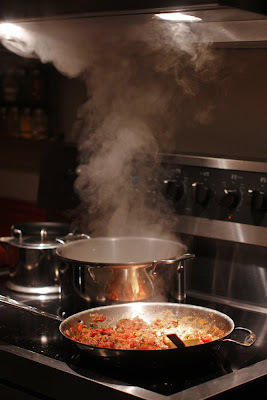 Return to the heat and allow it to simmer uncover to concentrate the flavors. The longer it cooks, the hotter and sweeter it gets. I filled corn tortillas with sauteed onion, field roast, mexican cheese, and spinach, then covered them with the sauce, and baked them in a 350 degree oven for 25 minutes. Serve with rice and beans. The wife and I keep a giant tub o' almonds in the cupboard at all times. They give a nice boost to a blue cheese salad, they are wonderful in couscous, and they are one of the best snacks you can grab on the go. We have all heard about the health benefits of raw almonds, so I decided to come up with another great way to enjoy them. I hate to see people count them out, and take them as if they are medicine. Just because they are healthy doesn't mean you can't enjoy them. I developed this grown up version of the classic PB&J that substitutes raw almond butter for the peanut butter and chopped dried apricots for the jelly. 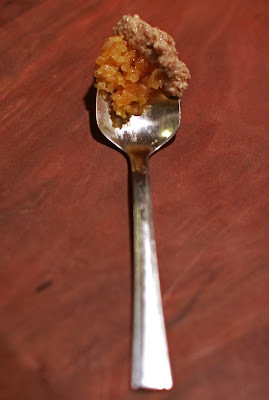 I add a hit of sweetness with a little local honey. If you have a food processor this takes not time at all. Throw the almonds into the food processor, and turn it on. Let it go for about a minute until the almonds are finely chopped. Add the oil, and a pinch of sea salt. Start it back up, and allow it to run until the powder turns into a paste. You will know it when it happens. Transfer the almond paste to a tupperware, and clean out the food processor. Add the apricots and water to the food processor, and pulse until the fruit is chopped. The dried fruit will absorb the water. Assemble the sandwich. 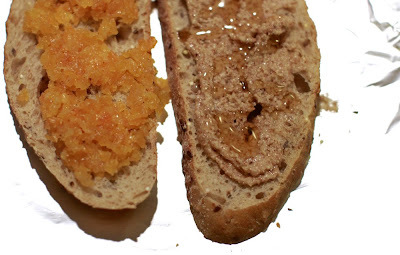 Spread almond butter on one slice of toasted rustic bread, and spread the apricots on another slice. Drizzle with honey, slap it together, and enjoy. Hmmmm, what to say about tortilla soup? I love it, that's for sure. 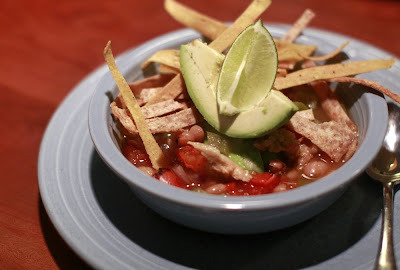 The spicy broth, the creamy avocado, the crunchy tortillas...the fact that I can go from thinking I want tortilla soup to eating homemade tortilla soup in about half an hour. This spicy soup seems perfectly suited for cool spring nights like the ones we have been having. Pour a few tablespoons of olive oil in to a large soup pot and set over medium high heat. Toss the seitan in the flour and then place it into the pot. Allow the seitan to brown which should take about 4 minutes. Add the onion & green pepper. Cook until the onion is translucent and then add the seranno, beans, tomatoes, garlic, broth cubes, and water. Bring to a boil and then reduce to simmer. Cut the tortillas into thin strips and toss with olive oil. Place under a broiler until crispy. You have to watch them because they will easily burn. The soup is now ready when you are. Stack two quarters of avocado in the middle of a bowl, ladle the soup around it, and garnish with a lime and crispy tortilla strips. This is also great with some fresh corn and cilantro if you happen to have some on hand. 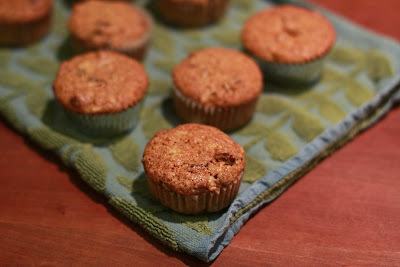 I have been wanting to make these muffins for a while since I've been seeing similar recipes just about everywhere. 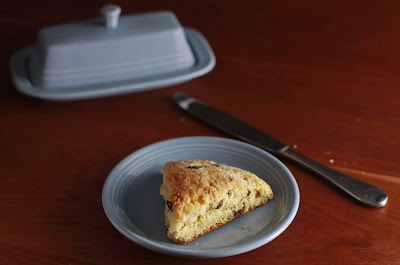 This one came from Southern Living -- one of my latest housewifely magazine subscriptions, a new obsession now that my grandmother hooked me up with Family Circle for my birthday this year and, after being a bit doubtful, I saw how useful it was. This recipe makes a lot... it yielded 12 muffins and a loaf of bread. The addition of crushed pineapple + all the juice from the can really makes it moist, and I love a new use for pretty golden raisins. 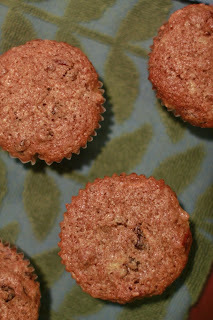 Bran muffins are great, but these may be even better. When I have the time, I like to make a big deal out of lunch. This usually means having something other than a sandwich, and eating at a table, not standing at the kitchen counter. It is a time for me to relax and get creative in the kitchen as a little break from the craziness of my work day. You know you have a well-stocked fridge when you open it up and notice you have all of the ingredients to make fresh lemongrass & ginger tofu. It is simple to make, but the flavor is extraordinary. 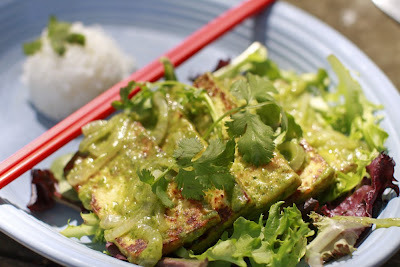 If you like your tofu spicy, go on and give this dish a shot. Pan-fry the tofu with olive oil in a non-stick skillet until brown and crispy on both sides. This should take about 4 minutes per side. Remove tofu from the pan and drain on a paper towel. Add the onion to the pan and cook until translucent. Remove from heat. Place all sauce ingredients in a food processor and turn it on high. Add the water a little at a time until the sauce comes together. Allow the processor to go until sauce looks liquid. Return the pan to the stove over medium heat; add the sauce and cornstarch. whisk to incorporate. Add the tofu to the onion and sauce mixture. Allow everything to heat through and toss to coat the tofu. Serve the tofu on top of the lettuce with a side of jasmine rice. This is also great served with sliced cucumbers and tomatoes. *To use fresh lemongrass: slice off the root end and the top. 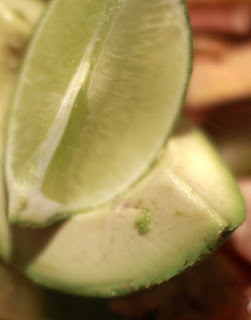 Peel the outer layers back until you are left with only the soft part of the stalk. It will be almost white in color. I need to make them one more time before I post a recipe, but I think I'm on to something here. 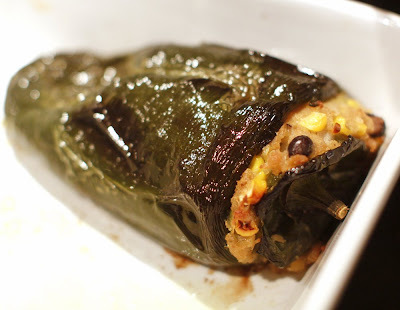 Why wrap tamales in a corn husk that you peel off and throw away when you can use something to add tons of flavor? So I stuffed poblano peppers with masa and veggies. They were delicious. 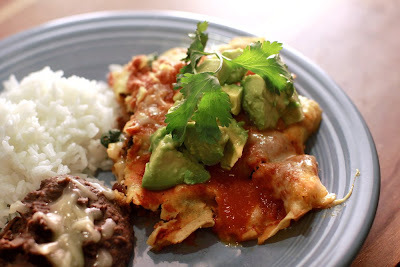 To serve I smothered them in homemade ranchero sauce and fresh guacamole. I threw this dinner together the other night before running out the door to band practice, and it was surprisingly good. 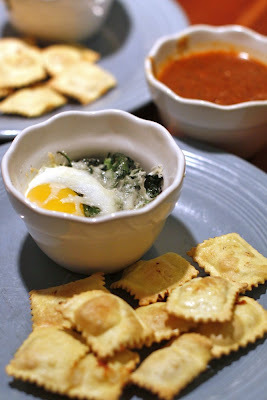 I knew I wanted to make the toasted ravioli, but had not yet decided how I would make it a meal. I opened the fridge to find a bag of fresh spinach. Our standard way to prepare spinach is to make a simple salad or to saute´it with garlic and olive oil. Both are good, but I was in the mood to do something different. Each serving contains a half a bag of spinach plus an egg. I call that some protein and iron rich good eating. Make this healthy side dish next time you make pasta. I think you'll really like it. Preheat the oven to 350 degrees. Drain the blanched spinach and squeeze the water out. Season the spinach with salt & pepper, and add the minced garlic clove. Toss to incorporate ingredients. Divide spinach between two small oven safe dishes, and crack one egg on top of each. Sprinkle with parmesan, and bake until the white of the egg has set. This should take about 10 minutes. I have seen fresh baby artichokes in the store for years, but I always passed them up because I never knew how to prepare them. I couldn't figure out why anyone would want to get a tiny bit of meat from those tiny little leaves, and end up with a tiny little artichoke heart. That is not the case at all. You prepare them differently than larger artichokes. I must admit that I learned this by watching the Rachel Ray show the other day. She did a little segment on baby artichokes that was an eye opener for me. With a sharp knife, simply slice off the upper half of the artichoke, and then break off any tough leaves from the bottom half. Peel and trim the stem. The rest is edible. No joke! You can even eat the choke because it is tender. 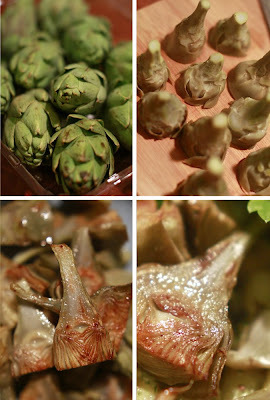 As you trim the artichokes, toss them into boiling lemon water. Let them cook for about ten minutes or until tender. Remove them and let them cool. To serve slice in half, and saute´in a tablespoon of butter until brown. I served them over a bed of pesto pasta. The pesto was made from a handful of flat-leaf parsley and assorted herbs from my garden like thyme, oregano, and rosemary. I tossed all of that into my food processor along with a handful of raw almonds, the juice from a meyer lemon, salt, and olive oil. I pulsed the processor until all of the ingredients were finely chopped. Toss pesto with cooked pasta and fresh mozzarella pearls. 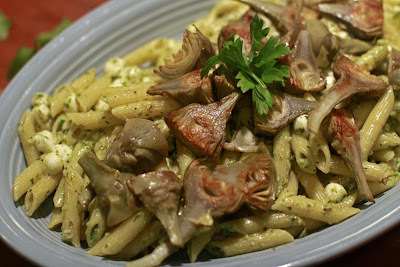 Top with sauteed baby artichokes and enjoy. The other day I spotted a tattoo of a lion peeking out from sleeve of my friend David's T-shirt. I asked him about it since we have been friends for 15 years, and I had never seen it before. He said it was from his family crest which got me thinking about what TCV's crest might look like. 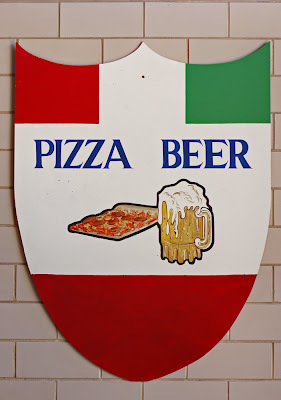 Maybe it would look something like this crest I found inside The Italian Rebel restaurant on Winchester. Maybe? I'm trying to avoid a caloric overload, so I called a vegetarian friend, East Memphian Justin Fox Burks, for advice. 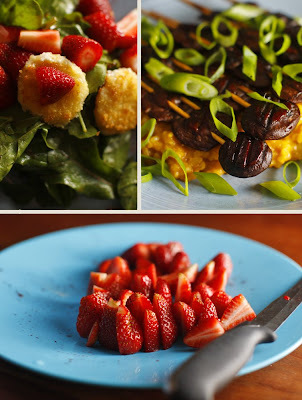 Along with his wife Amy Lawrence, Burks, a photographer, chronicles his food experiments on a blog, The Chubby Vegetarian, and teaches freelance cooking classes at the Memphis Botanic Garden and at Whole Foods Market. A few years ago, Burks perfected a grilled flatbread pizza that's delicious topped with just-picked seasonal vegetables, roasted eggplant and feta cheese, or a Puttanesca sauce. Shunning an aerated pan, he cooks the dough directly on the grates of his gas grill then finishes off the pizza under the broiler. "There's something about that crust coming into direct contact with the heat source," Burks said. "It's where the magic happens. Don't be afraid: You have to throw it on there with the peel, and trust that it will be fine." In our circle of friends, Burks is known for his so-good-you-forget-you're-not-eating-meat concoctions. 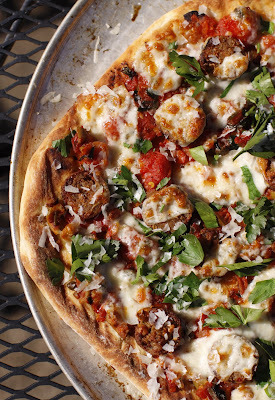 "When it comes to vegetarian food, pizza is the great equalizer," he said. "People don't look at a slice of pizza the way they would if I tried to serve tofu. Plus, it's so much fun to cook with other people. "It's one of those great meals where if you have the dough and the sauce ready to go, you're just 8 minutes away from eating." Do you know what is harder than math? Coming up with a new pizza flavor that is not revolting. I mean really. Look at some of the things the pizza giants have come up with: Anyone want a chicken bacon ranch pizza, or a mexican style ole' pizza with shredded lettuce and ground beef, or a hula hawaiian? Yuck! I think that I may have something here, and I have never seen it before. I took my puttanesca sauce and served it on olive-oil grilled flatbread with provolone and fresh parsley. Let me tell you it was magic. The grilled bread and the salty, spicy sauce were the perfect combo. I'm putting this one into syndication. Throw the dry ingredients including the honey into your Kitchen Aid stand mixer with the dough hook attachment, and then turn it on low. Add the warm beer 1/4 at a time. You may need the whole beer, and you may not. Look for the dough to come together. You will know it when you see it. Let the mixer run on low for about 15 minutes. This will develop the gluten in the bread flour which is required for a good pizza dough. Now turn off the mixer, remove the dough hook, and coat your dough in a generous amount of olive oil. Cover the bowl with plastic wrap and set aside. The longer you let it rest and rise the tastier it will be. I let mine go a minimum of a couple of hours, but you could let it go for a day if you'd like. Remove the dough ball, punch it down, and divide in half. Make each half into a ball. I do this by cupping my hands together and rolling the dough around on the countertop. Go Turn your gas grill on high so it can heat up. Use a little flour and your rolling pin to flatten each ball into about a 12 inch round. Store each round on floured pieces of waxed paper until you are ready to grill. Ok. Go outside with your pizza dough, olive oil, and a pair of grill tongs. This is kinda tricky, but not difficult. 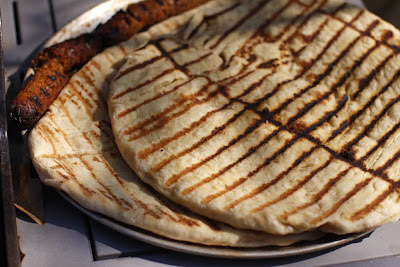 Douse one side of your flatbread with olive oil, and rub it in with your hands. Now peel the dough away from the waxed paper and flop it onto the grill olive-oil side down. Allow it to cook for about 4 minutes. You will see the bread start to rise. Flip it over using your grill tongs. It is best to grab it from the middle so you do not tear the bread. Cook that side for about 5 minutes. It takes longer because it has less oil. Repeat with the other flatbread. Turn your broiler on high. Sauce and cheese your pizza, and then stick it under the broiler until the cheese is melted. Garnish with some chopped parsley and parm, and then enjoy. There are several racy legends behind the invention of this particular pasta dish. 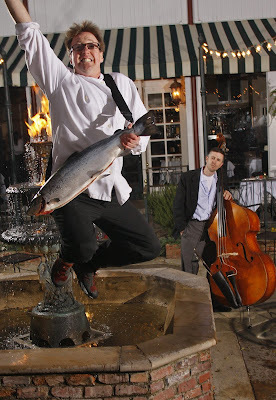 (Nothing like a good backstory to keep dinner interesting, right?) Try this salty, spicy, fast recipe any night of the week. The addition of the grilled sausages adds a nice smoky element & a little protein. Heat the oil over medium-high heat, and then add the garlic. Watch it closely, because you do not want the garlic to burn. It only needs to cook for about a minute before you add the can of tomatoes, juice and all. Add the rest of the ingredients -- save for the chopped parsley. Continue to cook until most of the moisture has evaporated. This should take less than ten minutes, which is about how much time you need to cook the pasta. Add the parsley to the sauce a few minutes before the addition of your pasta. I pull the pasta straight from the pot and throw it into the sauce. This way it stays hot and doesn't clump. Now toss the pasta and sauce together until nicely incorporated. 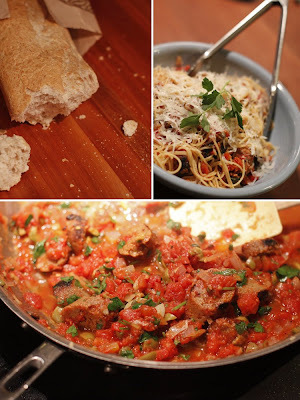 This is a dish served best family style with a rustic loaf of bread, so find a large bowl or dish, dump the pasta in, top with some parm and parsley, and dig in.